Please note: Many browsers will download the file in the background and it might not be obvious that the download has taken place. Please check your downloads folder. Continuing to click on the link will simply place multiple copies of the file into your downloads folder! If you would like a higher resolution copy of this file (about 64MB!! ), please contact me. 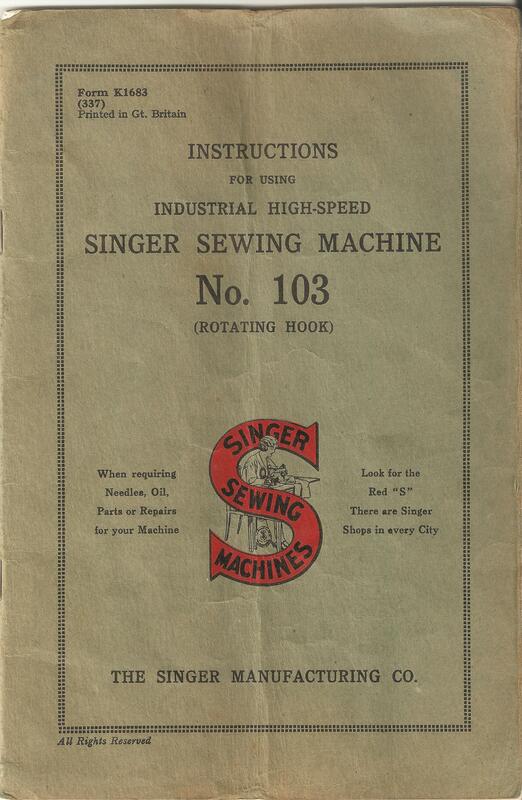 This is a PDF copy of the original manual for my Singer model 103 treadle powered sewing machine. I have the original purchase receipt for this machine, dated July 1940. The machine is in superb condition and is the most frequently used of all my collection; mostly for sewing vinyl and light leather. Every collector has their favorite machine and this is mine. Utterly reliable and trouble-free, it will sew everything from the flimsiest fabric to 3mm chrome-tanned leather. Hi eofolks and thank you for your message and I apologise for my tardy reply. It really is satisfying to know that my efforts have been of use to somebody else. I seem to have acquired a collection of sewing machines over the years, although it was never my intention to do so when I set out. I was just looking for machines that would carry out specific tasks, hoping to be able to make a few pennies from making grocery bags, vinyl and leather goods and doing a bit of repair work. I did make myself a few shirts and had a half-hearted go at a pair of trousers, as well as trying quilting and embroidery. I find myself much more drawn towards producing vinyl and leather goods though. However, I do have my collection and I have manuals for many of my machines. So if there’s anything else you need, it might be worth an ask. 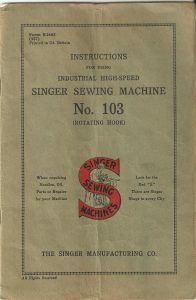 ISMACS, the International Sewing Machine Collectors Society, makes available a good deal of excellent information on the old Singers, including a serial number database and some information on the various model variants. While I can’t vouch for the accuracy of all their information, it appears from their info that the main difference between the basic 103 and the 103K2 is the distance between the needle and the pillar. The 103K2 appears to be a long bed machine that would be capable of sewing larger items like sails and tents whereas the ‘normal’ machine has a standard bed size. I have never seen a wide bed version but would certainly snap it up, should one ever happen my way. I have two 103’s, one of which I use for all of my vinyl and light leather work. Mine are both treadle powered machines. My model 29 machine is a 29K2 from 1902 and it was thoroughly worn out when I got it with the stitch length mechanism being utterly non-functional. They are delightfully simple machines though and it took only a few hours to put mine to rights. It sews a full range of stitch lengths now, through the simple addition a some metal shims cut from a tin can! I hope this info is of some use and I do recommend that you have a look at the ISMACS information. If there’s anything else I can help you with, please don’t hesitate to ask.